Madam Mim is a highly skilled witch. She was originally created by T. H.White for his novel The Sword in the Stone from 1938. 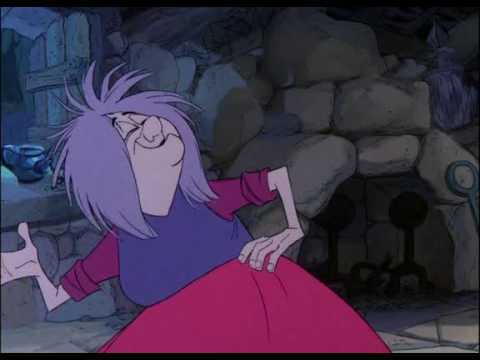 White rewrote the story in the 1958 version The Once and Future King where Madam Mim and her Wizard's Duel with Merlin was left out, but when Disney adapted the story in 1963, Madam Mim was used in the story although in a somewhat altered form (voice by Martha Wentworth). Mim is presented as boisterous, mischievous, and rather conceited, a sorceress much impressed with her own power who delights in causing trouble. She is also a somewhat morbid character with a distaste for sunshine and all things wholesome. She has got green eyes and grey hair with a purple tinge. The main ability she can display is her shape-shifting skill with which she can take the form of anything she wants. She can magically make herself uglier, and then beautiful. She can turn into: an alligator, a fox, a hen, a elephant, a tiger, a rattlesnake, and a rhinoceros, all of which were colored pink and an ugly, purple, fire-breathing dragon. Self-serving, bad-tempered, quite unscrupulous, and, above all, mad, mad Madam Mim ....yeah! She is cool! Archimedes the Owl: Rules indeed! Why, she only wants rules so she can break 'em. Madame Mim: I'll take care of you later, feather-brain. Madame Mim: Rule One: No mineral or vegetable, only animals. Rule Two: No make-believe things like, ooh, pink dragons and stuff. Now, Rule Three: No disappearing. Merlin: Now Mi-Mim, n-no dragons, remember?